The clothes I wanted to talk about this month were my charity shop finds! I've noticed other bloggers that I've been following purchasing items from charity shops as well so I'm glad the stigma is being tarnished a little. The perks of volunteering in a charity shop to do my bit is getting to find the bargains before anyone else! Because I see what goes on behind the scenes and know that everything is washed/steamed to perfection, I don't care if something has come from a charity shop if it's something I love. 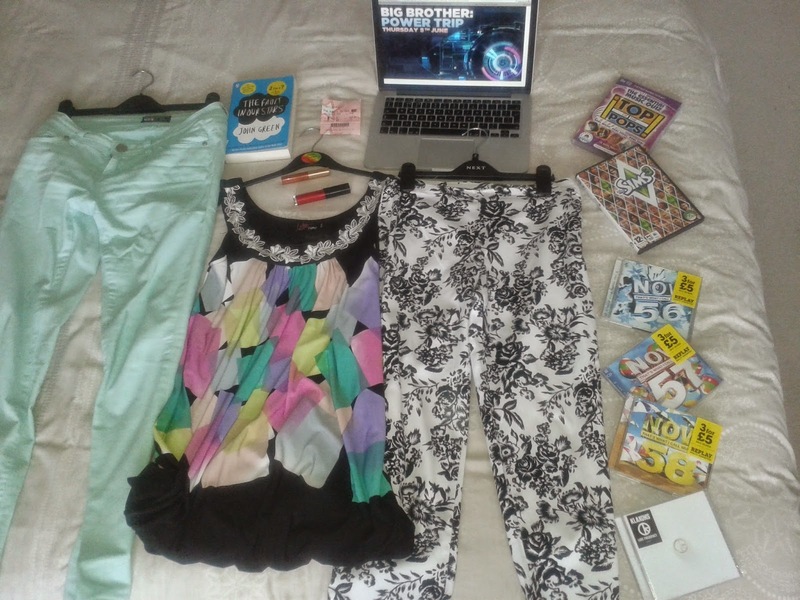 Most of it is high street stuff for a fraction of the price! Anyway, I was on the lookout for some summery pieces and these three items pictured are my favourite charity shop finds this month! 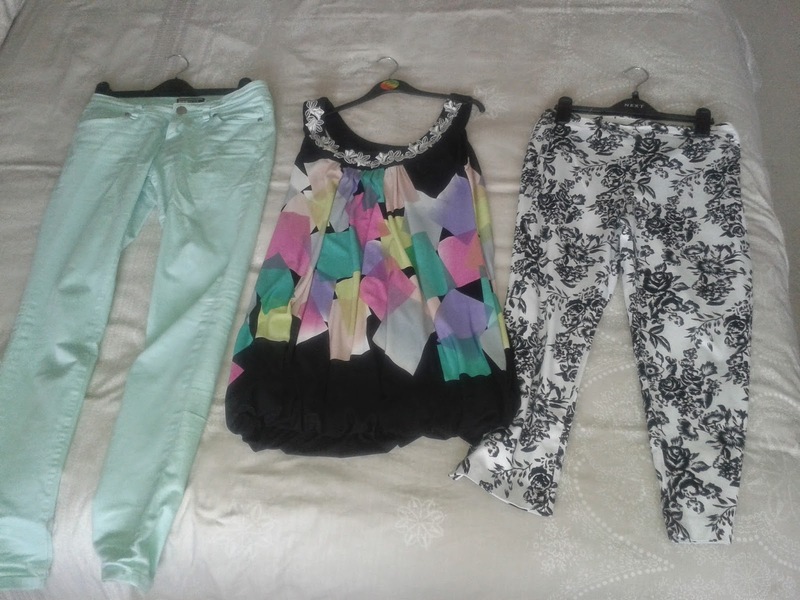 I was on the lookout for some summery looking jeans, and I love the mint colour of the jeans pictured on the left that I managed to find in my size, which according to the label are YESYES jeans, found in New Look. I don't think the picture does them much justice as they were a bit creased, but I assure you, in my opinion they're gorgeous! I absolutely adore the top in the middle, which is quite a formal vest design. The colouring is rather psychedelic, with a girly white flowery touch added. According to the label, the make is YUMI, sold at places like House of Fraser or ASOS.com. Lastly, I found the three-quarterlength trousers and simply had to have them! I adore monochrome and flowers, so what an ideal match! They are originally from M&S. The lipgloss I use daily is quite a vampy purple one, but I usually do tend to experiment from time to time. This month there have been two I've been experimenting with. 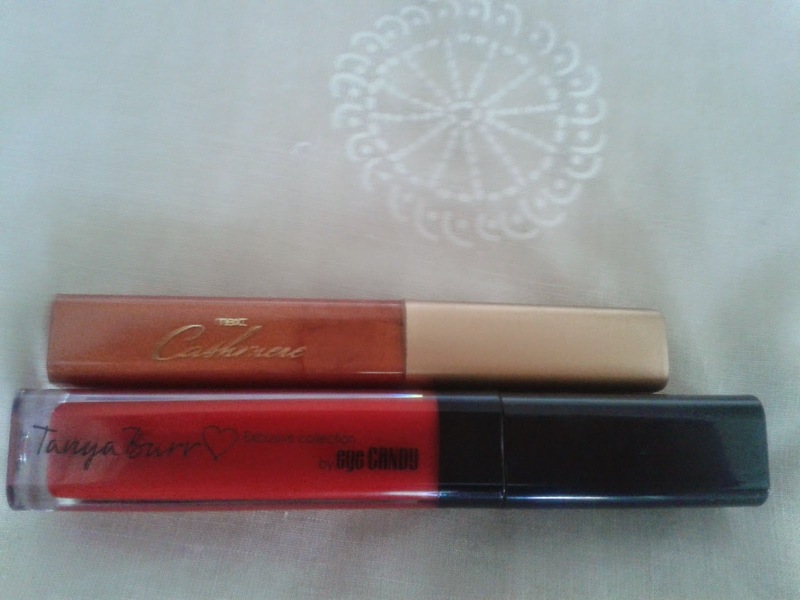 Firstly, like in the clothing section this month, I really wanted a summery lipgloss, so this month I've been using the Cashmere lipgloss available from Next. 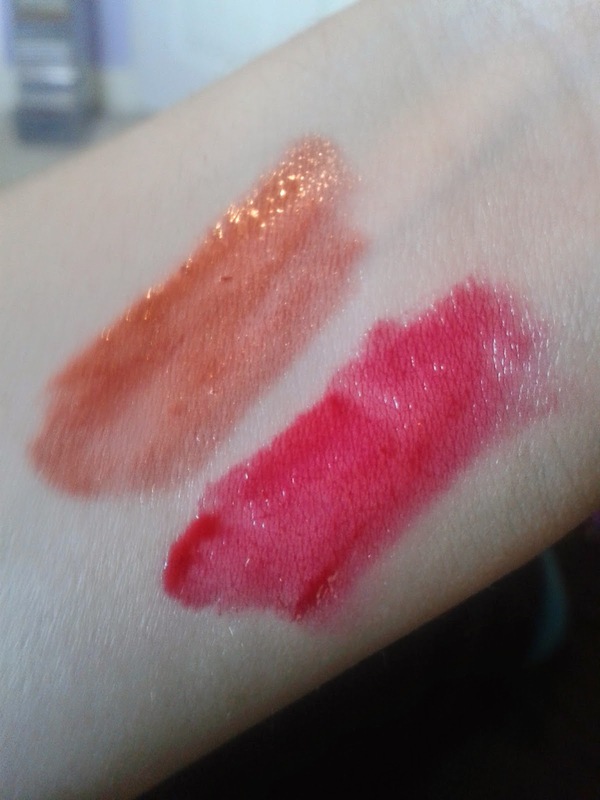 Secondly, I absolutely love YouTuber/Blogger Tanya Burr, and after purchasing the more subtle Afternoon Tea make in her range and loving the style and quality of the product, I wanted a more dark shade as I love more dramatic lip shades, so of course I went for the boldest colour in the range - the 'Vampire Kiss' one! From the packaging I thought it looked a very dark red shade, but when applying, it is more like a very dark pink, as you can make out from the swatch above. Still very nice though, bold is what I was looking for and that is what I got! Her range is available from Superdrug. If you also follow my music blog, then you'll know that for the past few months, I've been buying older Now albums to update my music collection with some more 2000's music. 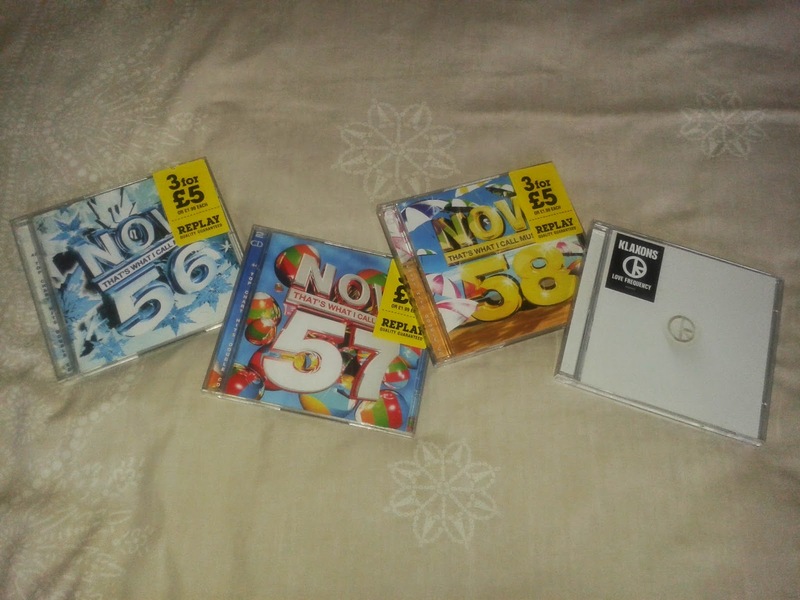 The editions I bought this month were Now 56 (2003), Now 57 (2004) and Now 58 (2004). They were all from That's Entertainment, I got 3 for £5 but usually they are £1.99 each. They brought back so much nostalgia when the likes of Britney, Kylie & Justin (NOT Bieber!) were at the top and reminded me of what I loved as a Primary School child, aw. In terms of more up to date releases, the only one I've got this month is 'Love Frequency' by Klaxons. I decided to purchase it after hearing the two stellar singles 'There Is No Other Time' and 'Show Me a Miracle' from the album. They're an indie-rock band, probably most memorable for their brilliant hit 'Golden Skans' which is one of those songs that you'll probably recognise, not ever knowing who it was by! I advise you to check them out! And yes, I do still buy physical copies of albums, I've always been such a collector and I just find it better to have a copy of the item itself, although admittedly they do take up a lot of space as I have so many over the years! Ooh I've been loving quite a few things this month! 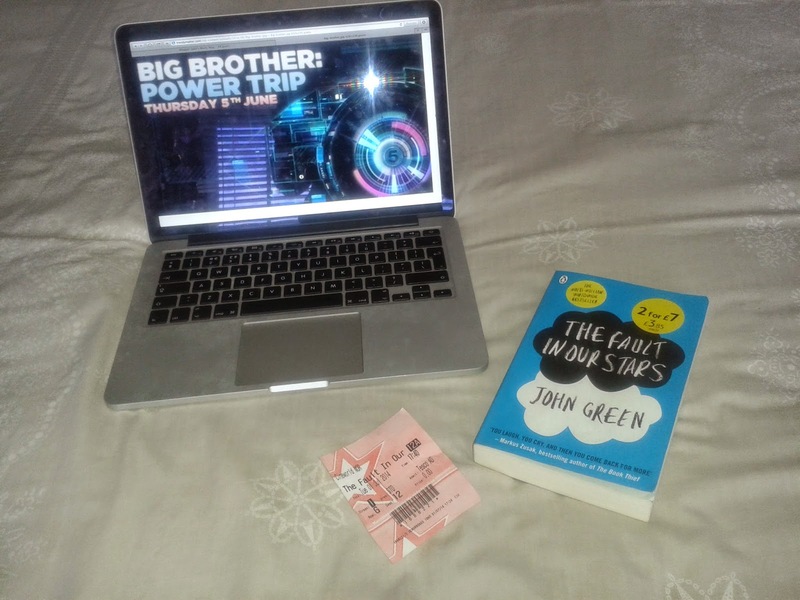 As a very typical teenage girl, I've been stuck into the Fault In Our Stars book by John Green (Only £3.95 in Tesco - result!). I finished it about a week ago because I knew that me and my best friend Emma were planning on seeing the movie and I adored it! A perfect balance of funny and sad, I was truly hooked from start to finish. The film adaptation did not let me down at all, the actors chosen to play Augustus and Hazel worked so well, they had such chemistry! It truly ripped my heart out and the minute it finished I instantly wanted to watch it again! Although some events/details were missed out, on the whole I felt it did stay true to the book! The accompanying soundtrack was fantastic as well, from more subtle tracks like Tom Odell to the more upbeat stuff such as Charli XCX's 'Boom Clap', a mixture of emotions felt, just like the film/book itself! Aside from the phenomenon that is TFiOS, I've been loving the latest series of Big Brother UK. This series, with a theme of Power Trip after last years Secrets & Lies, began on 5th June and we've already seen hate figures, drama and romances formed in just four weeks! My current favourite housemates are the intellectual Matthew and the ditsy but hilarious Mark, and their friendship is just fantastic to watch. Interestingly, I've been watching the first series from 2000 on YouTube as well, and it's changed SO much as you'd expect, from more of an authentic social experiment to more of a show that's aware of itself, but far more entertaining. Well, the games I've been loving this month are decidedly old! 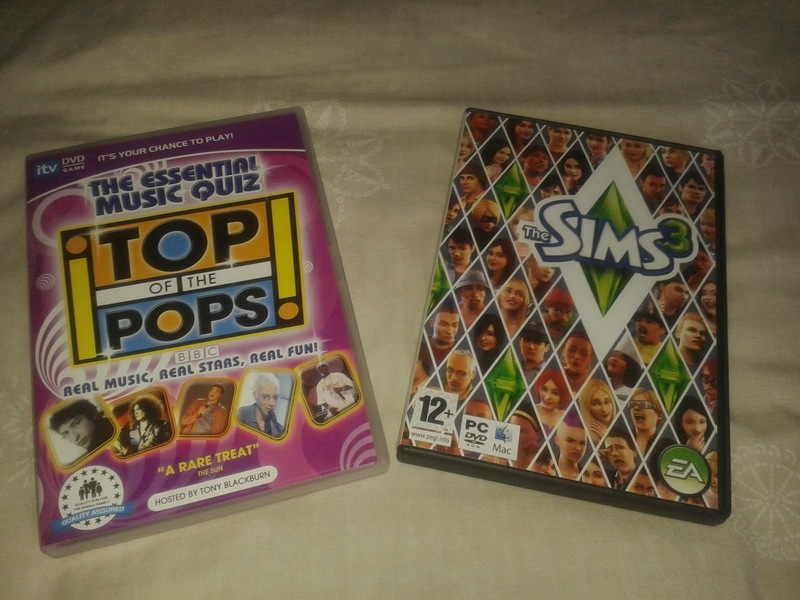 Firstly, I dug out the sims 3 a lot earlier this month thanks to my favourite YouTuber Joe Sugg (ThatcherJoe) starting a gaming series! He is making it so entertaining and infectious, so I immediately got my game out and started playing it for quite a while! I started playing the Sims way back in primary school with the Sims 2 so it was a very nostalgic experience! I've seemingly forgotten all the cheats though! The other game I've been playing this month was another charity shop find this month, for only £2.50, and my family are quite quiz addicts, always watching shows like the Chase or playing trivial pursuit, and because I love music so much, I bought this and roped my brother into playing it with me! Annoyingly our sibling rivalry makes us very competitive, so when my brother beat me the once I received a range of 'I WON' snapchats from him! The questions were admittedly quite difficult, so it wasn't as fun as the NOW music quiz game, but I still felt I knew a fair amount and if anything it expanded my knowledge by not being very good! It's the 2007 edition if you're interested, so it helped that it was fairly new. 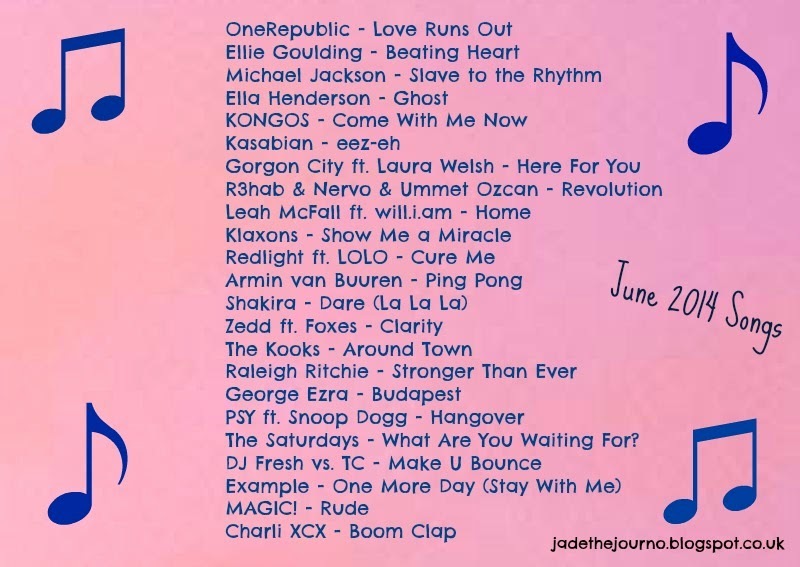 So that's it for my June favourites! I sincerely apologise that this was so long but I wanted my first blog post to be impressive in content - and length ended up following that! But I hope everyone enjoyed, it was a lot of fun putting it together! Any suggestions for future articles please comment below or if you want me to check out your June favourites then also feel free to link and I'll comment on it! Thank you so much lovely! :D Tanya Burr's stuff is just fab, glad to hear you're also a fan! 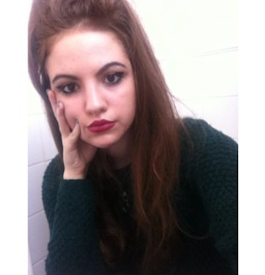 I want to get one of her nail varnishes too but I'm a bit low on cash haha! Go for it, the one I found in her collection was really good in my opinion :D Haha aw that's awesome, they're so good for nostalgic value, so many memories! 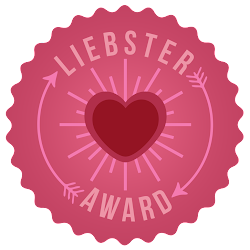 Thanks so much Lauren, thanks for commenting! Haha I know right?! Madness! The first one I actually bought myself when it was new was Now 60 and even that was back in 2005! But it's cool that the U.S. has a series too haha :D Aw that's awesome, the first one here would've been on vinyl in the 80's! Glad to hear you loved it, I really want to see it again already! Aw thank you very much, lovely! YES I'd highly recommend Tanya Burr stuff, the shade is bold but so beautiful, never be afraid to try it! Ooh lip gloss is just fab, I'll have to maybe check that one out! Those black and white printed pants are fantastic! Ooh haha funnily enough I was wearing them today! Was so happy when I found them, such a brilliant find! Thanks for commenting!